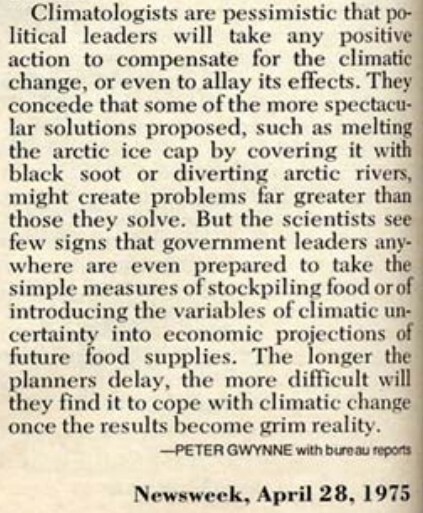 Climate scientists are much smarter now, and know that bad weather is caused by melted ice. It used to be caused by unmelted ice. Apparently there wasn’t any consensus about the threat of an oncoming ice-age, so this group must have been a minority.. you know, similar to the odd looney like Schneider who wasn’t a respected or prominent scientist, and who appeared on a well known TV show aired around the world. Oh, and Lamb.. such an obscure figure, really; like Hansen is these days. There’s no consensus today on any portion of AGW either. The experiment described in 1975 is being performed. On the one side we have historical winter temperatures. Increases icepack. Icebreakers decrease ice. Picture ceramic tile with no grout. Ice becomes weak and unstable, more susceptible to wind and currents, which cause direct ice-ice collision and frictional sideswipes. Its not a fair fight. Let’s put “climatology” into the same category as phrenology and eugenics, and see it for the pseudo-science that it is, or has at least become.